This game is colourful, vibrant and full of life with absolutely beautiful visuals. I mean, there’s not as much to it as some games, but it’s a racing game, so there’s not much more than racing you can do with that. Mario Kart 7 goes back to the old days with different modes to play in. 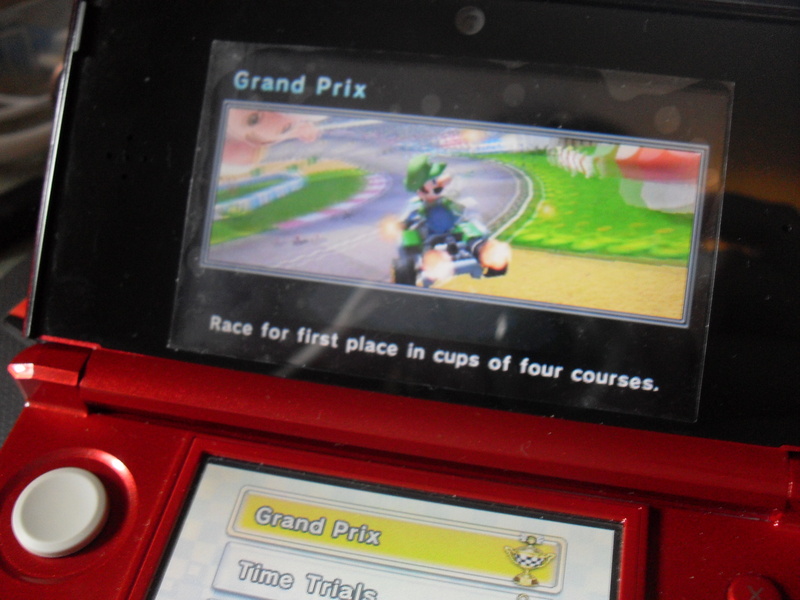 There is the normal grand prix, time trials and the fun but frustrating balloon and coin battles. There are also options for single and multiplayer. In my first grand prix, the mushroom cup, I seemed to grasp the general controls quite quickly and managed to win the first 3 races. It all went downhill on the fourth however and my winning streak turned to disaster. One thing you can do on Mario Kart 7 is glide using giant kite thing attached to your car. The problem was, I did not know how, but I guess that what you get for not bothering to read up on the controls. Anyway, I couldn’t get past this one jump and came last, not even managing to finish! Luckily, my previous victories managed to secure me second place overall, so not bad for a first go. Control of the car is relatively easy and there are some good choices in terms of speed and handling. I’ve only played a few courses, but so far they are creative and bold. My favourite has to be Wuhu Island Loop in the Flower Cup. I’ve spent a lot of virtual time on that island on the Wii and so to see it appear to race on was awesome. Cheep Cheep Cape in the Mushroom Cup is also interesting down to the fact you race underwater. I was also pleased to see the return of Luigi’s Mansion in the Shell Cup. The music is of typical Mario standards, very jingly with a different track for each course. It gets quite annoying after a while, but I would have expected no less.